The original photograph for this card would have been taken from Lea Wood. On slopes of the hillside on the left is Coumbs Wood which, together with Bough or Bow Woods, was purchased by Peter Nightingale from Edmund Morphy in 1771. Bough Wood is out of shot, slightly to the left of this image. Lea Mills, bottom left, was built in 1783 by Peter Nightingale and Benjamin Pearson as a cotton spinning mill. It was built on the Lea Brook, the boundary between Matlock and Lea. The mill was acquired by the Smedleys in 1807 and the family transferred their hosiery manufacturing business from Wirksworth to Lea in 1818, though it was not successful at first. It was the John Smedley of hydropathy fame, who took over the business from his father and began to manufacture high quality wool underclothing at Lea, who turned the mills from failure to success. It was here he founded his free hospital in 1851, with about thirty patients at any one time. He was "a true philanthropist". Bryan tells us that by 1903 Lea Mills had been extended over the Matlock boundary and almost half of the buildings were within Matlock. 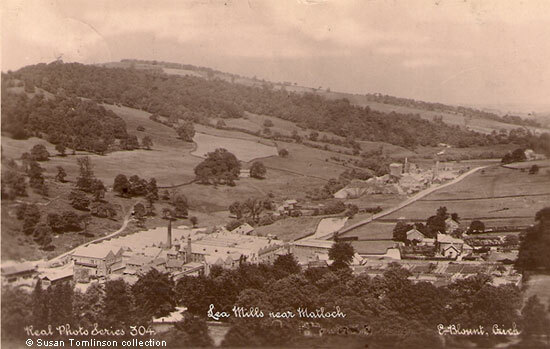 In 1936 an article about Lea commented that "down in the valley, which ascends steeply between the hills from the Derwent at Cromford to the heights above Crich, are the large mills of Messrs. John Smedley Ltd., hosiery manufacturers, where hundreds of girls from all parts of the Matlocks and the villages around find employment". Lea Mills is still a major employer. A little further up the hill from Lea Mills was a cupola for smelting lead. Lea Lead Works had been a partnership, trading as John Alsop & Co. until 1834, when Joseph Wass became the sole owner. At the time the photograph was taken it smelted the ore from Mill Close mine at Darley. The cupola's chimneys were quite distinctive as they were built up in layers or stepped, with each layer slightly further in than the one below. A large slag heap built up over the years on the lead works site; it can be seen just below the works. Amongst the other buildings shown in this picture is Splash Farm, which lies between Lea Mills and the smelting works. On the far side of the lead cupola is what was the manager's house, lived in at one time by Mr. John Else and his family. About 1923, following the death of Mr. Else, the Snowball family moved into Lead Works House and the property gradually became known as Snowball Cottage. The Snowballs were the last lead smelter family to live there. At the top of the road (half way up the photo and on the extreme right) are a group of buildings partly hidden by trees. These buildings are Cow Gate which, at the beginning of the twentieth century, were divided into five homes. "Lea Mills near Matlock", E. Blount, Crich. No.34. Posted 1924. "Derby Daily Telegraph", 22 July 1936. Article by H P Channon. "The Derby Mercury", 13 May 1835.